Andrew Kessler graduated with a BSC (hons) in biochemistry from the University of Cape Town in 2001 before spending 8 years in post graduate research in biochemisrty and organic chemistry. During this period he ran the MALDI mass spectrometry unit for two years in the Molecular Cell Biology department, studied the photoinduced breakdown of Azithromycin and Cytochrome P450 Alkane Hydroxylases. 2013 Was placed in the Swiss SEED STARS top entrepreneurs for geo-location technologies. 2013 Winner of the IDC Inventors Garage Competition for mobile app development. 2014 CTO for an N-doped high temperature semiconductor start up. 2015 Key note speaker on KLJN key agreement protocol to the South African National Defense Force. 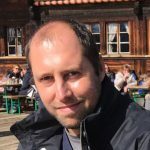 From January 2016 onwards Andrew Kessler has taken residence as Xenotta’s CTO building an exhaustive smart data protocol and architecture which integrates and automates traditional computation with the power of blockchain oracles. Smart data is embedded with legal rights and true economic value as a default part of its binary build which enterprise, research and developers leverage to build game changing applications.